Why this is a must-have eyebrow pencil? express yourself with confidence for the whole day! How to fill and blend for full and natural-looking eyebrows? CERESIN, HYDROGENATED MICROCRYSTALLINE WAX/POLYETHYLENE, BEESWAX, ETHYLHEXYL PALMITATE, LANOLIN, MINERAL OIL, ISOPROPYL MYRISTATE, HYDROGENATED POLYISOBUTENE, DIMETHICONE, PARFUM, BHT, METHYLPARABEN, PROPYLPARABEN ,CI 15850, CI 77491, CI 77492, CI 77499, CI 77891. 【3 Shades in 1 Brow Pencil Set:】buy one and you will get 3 natural-looking shades, including dark brown light brown and coffee. Featuring replaceable end, you can switch the shade at any time. 【Triangular Tip Brow Wiz:】featuring triangular tip that can be used in three different ways to outline and fill brows, sharpest point to create fine, hair-like strokes, medium side to create thicker, hair-like strokes and the wide side to create broad strokes. 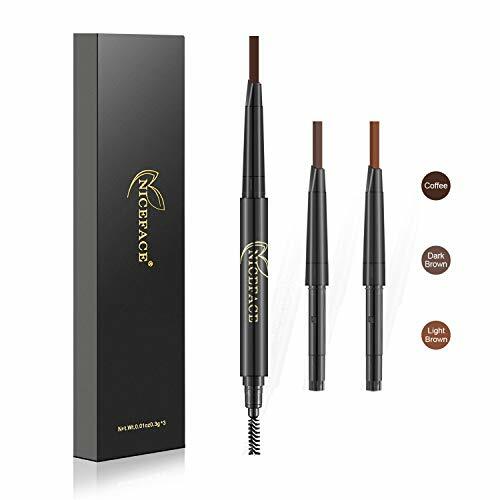 【Dual-ended Eyebrow Definer Pencil:】the pencil end will outline your arches and filling them in with detailed, hair-like strokes. The other side features a flexible spoolie-brush for seamless blending and getting your eyebrows into place. 【Long-lasting Eye Pencil:】the smudge-proof waterproof and sweat-proof formula wears perfectly for hours, you will maintain natural-looking, balanced and perfectly defined eyebrows during the whole day. 【Retractable Drawing Eye Brow:】with the mechanical self-sharpening tip design, you can save the trouble of sharpening the pencil. Do not rotate the pencil too much in case it crumbles easily. If you have any questions about this product by NICEFACE, contact us by completing and submitting the form below. If you are looking for a specif part number, please include it with your message.